Judging by this historical marker located near the observation point at Benge’s Gap, Chief Benge probably wasn’t someone you’d like to have over for dinner. But wow, what a view. This scene is located in the heart of Southwest Virginia on Route 23/US 58-Alt. If you ever find yourself on the trek from Abingdon to Big Stone Gap (something everyone should do at least once in their life), this will appear on your left. To make it over to the observation point, you’ll need to go further down the road and kiss the outskirts of the latter town as you make a u-turn back towards the wooden platform. Bonus points if you catch the fall colors. It was my third trip out to this area of Virginia and when we finally found our way to the perch, I took out every camera I had brought, got them all ready to shoot and started firing away. I looked a bit like a freak – I’ll admit it. One of them, my Canon A-1 went into diva mode and decided it only felt like tripping the shutter when I moved the film advance lever. After a handful of throwaway shots, everything seemed to be back on track and I set it aside to concentrate on the other cameras. This photo was amongst the “throwaways” – proof that getting a gorgeous picture here is akin to shooting fish in a barrel. The film I used is Kodak’s Portra 400 – one of their newer emulsions that caters to skin tones. But basically any scene will benefit from this incredible film, not the least of which, one with shades of red. This beautiful fall day did not disappoint on that account. I ended up getting it developed at my favorite CVS, scanned it (with love) on the Epson 750 then brought it into Photoshop for some enhancements. The final product really blew me away, but I couldn’t help putting on one last touch: a tilt effect. In short, this effect mimics a tilt-shift lens which can create a “false” shallow depth of field, making the image look more like a miniature model than a miles-wide landscape. The resulting picture ends up highlighting the lives and structures in the valley as if they’re the backdrop to a fairy tale’s story line. 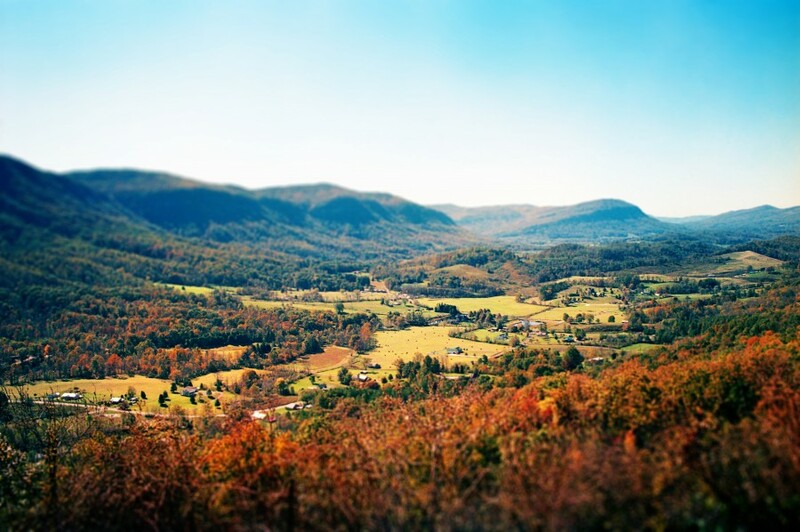 It’s an incredible section of not only Virginia, but our little world.